The next exhibition at the Toshidama Gallery is devoted to the great revenge drama of Japanese culture – the Chushingura – and other folklore heroes. To anyone familiar with ukiyo-e (Japanese woodblock prints) – the great visual art of Japan – prints of the Chushingura are instantly recognisable. The subject is either historical, in which case the 47 Ronin are always dressed in a familiar military garb of black and white dog-tooth robes, or else theatrical, in which case the prints depict kabuki actors dressed in kimonos of grey/blue spotted fabric decorated with arcane motifs of crossed feathers or compressed quotation marks in a circle. The current exhibition at the gallery is on the great printmakers of Osaka and we are showing two very fine portrait heads and an outstanding Hirosada triptych. The triptych is dominated by the rhythmic and bobbing circles of lanterns and logos, somewhat reminiscent of Uccello’s great painting of the Battle of San Romano (1440) in the National Gallery London which uses roundels on the bridles and fruit hanging from trees to much the same effect. What is the significance of these deliberate and nicely contrived symbols – so important that they dominate the composition? The culture of Edo Japan was controlled for hundreds of years by one family – the Tokugawa Shogunate. Nowadays, we would refer to Edo Japan of the sixteenth to the nineteenth century as a dictatorship or oligarchy. As a consequence, the government was authoritarian and at times so paranoid about dissent that oppressive laws were passed to restrict expression or criticism. Artists and writers were accustomed to using symbols and subterfuge in their work in order to circumvent this censorship. The Chushingura is a case in point. The original tale of the revenge of the servant samurai of a nobleman dishonoured by a palace official and obliged to commit suicide occurred in 1701. The tale was quickly translated to the puppet theatre and later to the kabuki stage. Since the act of revenge and the subsequent governmental sentence on the 47 ‘heroes’ could be seen as critical of the shogunate, the dramas that followed changed not only the date of the incident (to the fifteenth century), but also the names of the principal characters and other details. The play also took on a rigid form of conventions that were strictly adhered to thereafter, ensuring that audiences knew exactly what was being implied. Hence in the exceptional Hirosada triptych at the top of the page, the characters are dressed in the characteristic spotted grey of the kabuki Ronin. To further emphasise the point, the lanterns they are holding carry the crossed feathers (the maruni chigai tak an oha – crossed hawk feathers) clan crest or mon of Asano Takumi-no-kami Naganori, who is the actual character from the seventeenth century, making the connection to his fictional counterpart Enya Hanan. 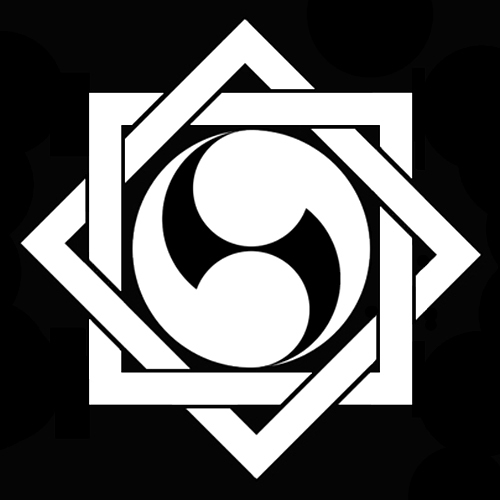 The double quotation mark mon is associated with the Ronins. Called the futatsu-domoe, the mon is formed of two large comma shapes inverted clockwise to form a disjointed circle and belonged to the samurai Oboshi Yuranosuke, the leading force behind the revenge attack and the plot that ended with the assassination of Kira Kozukensuke. In this outstanding print by Hirosada (above left) the character is played by Nakamura Utaemon IV. The use of the crest or mon begins with the noble families of Japan and the samurai, who used individual insignia to identify their possessions, their homes, armies, soldiers etc. The practice became so commonplace that a vast library of stylised designs were accumulated, all of which derive from commonplace objects in nature. There were some strict rules: ruling families (Daimyo) had unique mons that it was a serious offence to copy. By the nineteenth century though, after hundreds of years of peace, the samurai class were less protected and commoners were able to have their own crests made and used these on their homes and businesses. Kabuki actors also started to use mons. These quickly became imitative of the great warlord dynasties and the logos were handed down through generations of acting families. The crests appear as lavish embroidered and appliquéd decorations on the handmade robes of the stars of the stage. The benefit to us is that they help to identify either actors or historical characters in woodblock prints. Hence something like the concentric boxes of the Ichikawa family (as above) allows us to identify the actor in a particular scene – especially so if we know the approximate date of the piece. In many prints, especially those of the Osaka School, produced during times of severe censorship, the crests either of actor or character are sometimes the only clues that there are that enable any identification whatsoever. Toshidama Gallery sells original nineteenth century Japanese woodblock prints. We source our prints from around the world and only stock original, authenticated works of museum quality. This entry was posted in 47 Ronin, Japanese prints, japanese woodblock prints, Kabuki Mons, kabuki theatre, ukiyo-e art, Uncategorized and tagged Chushingura, Japanese prints, Japanese Woodblock Prints, Kabuki Actor Crests, kabuki theatre, Kanadehon Chushingura, Ukiyo-e. Bookmark the permalink.